Quite a long time ago, the military regulations of RF Armed Forces were revised. In which a direct request for artillery (barrel) support was received company commander, bypassing the higher standing commanders. The platoon commander also has the opportunity to request, but only with the approval of the company commander. 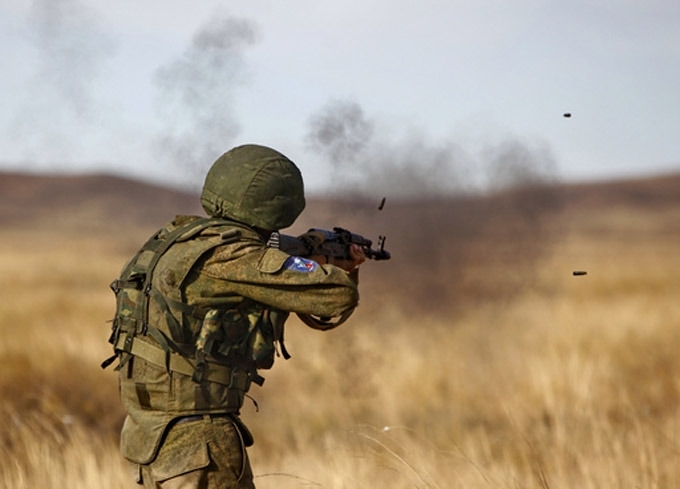 It is much easier with this in the troops of Airborne Forces, in them the commanders of squads are also taught how to correctly call and direct artillery support. Although in the combat statutes of the ground forces it is also recommended to prepare the most trained sergeants and soldiers by artillery spotters (to give basic knowledge). I, being a company commander, together with platoon commanders, trained sergeants on how to correctly identify the target on the map, call in and correct artillery fire.The sergeants were trained only by those who served in the contract service. In general, after the war of 08.08.08 and Syria, the military training of soldiers was very much revised. More attention is paid to the practice in the tactical field. Additional armor on the tower is impressive 100-150 mm approximately . I would say, checkmate of MoD RF. The plane can repeat the fate of SU-27, which at first looked different and has other equipment and then had to redo everything radically. With so many mounds on the body of the UAV is something difficult to talk about low visibility. Hunter-B ( Okhotnik-B ) The plane on which the elements of the Hunter-B ( Okhotnik-B ) were tested. Volkssturm Weapon P.S. Happy New Year ! Airmobile groups will appear in motorized rifle battalions of the Southern Military District. https://ria.ru/defense_safety/20181203/1538814748.html Dozens of airmobile groups will begin training in all battalions of combined arms and military units of Black Sea Fleet marines and the Caspian Flotilla of the Southern Military District during the winter training period, the head of the press service of the Southern Military District. A bit of the Arctic in our community... AA missile system "Tor-M2DT", based on tracked transporter DT-30M. Is Fulda Gap most likely never in the cards? I do not think that which side would be the first to use tactical nuclear weapons in the attack. I admit that the commanders of military units would begin to use it in cases of serious defeat. I have long wanted to also propose a time period of 1960–80, or more precisely 1983–89, when the armies of NATO and Warsaw Pact were equal in firepower. Without the conditions for use of nuclear weapons and not in spirit of Tom Clancy. There is a huge amount for the space of northern group of troops, western group of troops, etc , this is DLC. I once told how the rocket came back after the launch due to the fact that it was already quite old. Fortunately, everything went without a serious incident. @Vet 0369 We have an analogue "Uniform Code of Military Justice", only here it is called the All-Military Charters of the RF Armed Forces. It includes: 1) Charter of the internal service of Armed Forces 2) Disciplinary Charter of Armed Forces 3) Marching Charter of Armed Forces 4) Charter of the garrison and guard services of Armed Forces 5) Ship charter of Russian Navy 6) Charter of the military police of Armed Forces 7) The military regulations of Armed Forces - it has its own subparagraphs The first three charters are fundamental as they explain the relationship between the military, the requirement of them and their rights. For 10 years of military service, I felt the transition period of the army and all the delights of reforms. I understand people who are in favor of a professional army. Those whose standard of living is high enough do not want to "lose" time. Those who are timid, afraid of army difficulties. Those who want to find a job more profitable. But I also understand that it is necessary to change something in the soldier's training system. Restoring the initial military training in schools and DOSAAF is a necessary step, but just a step. The state should stimulate young people with a large number of benefits after military service. I don `t know what to offer for soldiers on conscript, I am against conscription, I know that there is money for a fully professional army. But I definitely know what to offer for those who served in the army for 3 years or more. 1) A decent salary for those who are now serving. 2) Such people can be offered a fully paid education in any university in the country. 3) Tax benefits in accordance with the years of service. 4) Free travel in public transport after 5 years of service. 5) Social benefits for the family. I read here that you discussed the minuses of military service under the contract. Yes, there are many of them. 1) The most obvious minus of military service under the contract is the need to risk both your health and your life. Many of my acquaintances in the civilian liberal views of the fact that our army nowhere should be at war. The army must fight only when an external enemy attacks our country. I came across some servicemen who do not want on business trips, they say - "I DO NOT WANT, I WILL NOT". At the same time, they do not understand that the contract for military service says nothing about the fact that they have the right to choose their place of service and with whom and when to fight. The state decides where and when to use the army, do not want to fight in Syria, do not sign a contract. Or go to politics and restrict the use of the army abroad. 2) Limitation of personal space and freedom. Not every person is ready to obey orders and unconditionally fulfill the requirements of the command. There is no democracy in the army. For this reason, 20% of people who signed a contract for military service, it is torn in 2-4 months. 3) Not standardized working day. 4) Family. 50% of marriages fell apart due to the fact that the wives did not like the new place of service of her husband. Imagine you are a year where next to a major city in an hour's drive, and then you are told that you are sent to a place where there is not even a mobile Internet. Luckily, I did not marry for the entire service time.